MANILA – President Rodrigo Duterte on Tuesday reiterated his promise to take care of his soldiers and policemen as he commended them for their efforts in protecting the Filipino people. 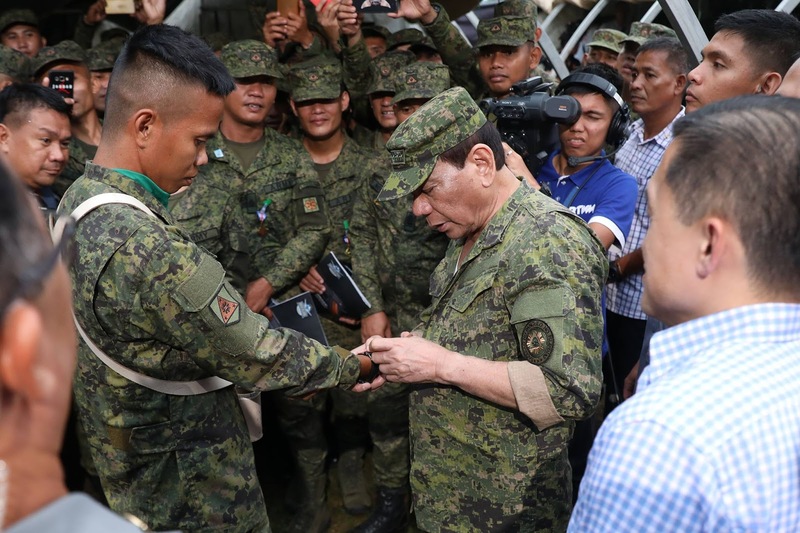 “As I have promised before to all our soldiers and policemen who risk their lives for our country and democracy: I have your backs,” Duterte said in his speech during visit to the 803rd Infantry Brigade of Philippine Army at Camp Juan Sumuroy, Catarman, Northern Samar. Duterte assured that he will not abandon the families of the soldiers who lost their lives while serving the country. “Just work well. Be cunning. Be smart. And do not be afraid of problems. Ako ang bahala hanggang ako pa ang nakaupo dito sa --- diyan sa Pasig --- hindi ko kayo pababayaan (I will take care of you while I’m your President. I will not abandon you) You will never have any worry at all. Inyo trabaho lang (You just do your job),” he said. “This administration will take care of you and your families by providing you with the necessary social and financial assistance,” he added. Duterte said his administration is working to strengthen the defense capabilities of the military and police. “For your brigade, we have provided additional transport vehicles and extended fund support for the enhancement of the roads in the camp, the administration building, and the 8th ID Liaison Office building,” he said. He also promised that all of the soldiers will have a sidearm "in due time”. “Now the reason why I decided to give each and everyone of you. costing billions, is because you go out of your house or your camp almost naked,” Duterte said. He also commended the Army’s 803rd Brigade for maintaining law and order and protecting the people against enemies of the State particularly from communist rebels. “Today we recognize the brigade’s accomplishments against the communist terrorists and their contributions in the campaign against illegal drugs. You have indeed served the country well with your recent achievements. Saludo ako sa inyo (I salute to you),” he added. Duterte said he is elated by the apprehension and surrender of New People’s Army (NPA) rebels from January to September this year. “I am pleased to know that you have neutralized and apprehended numerous enemies of the state,” Duterte said. He also reiterated his administration’s call for the communist terrorists to abandon their extremist activities and return to the fold of the law. “In fact, today, some of them will receive financial assistance under our Enhanced-Comprehensive Local Integration Program. This is just one of the several programs to help them on their re-integration into our communities,” Duterte said. The President said his war against drugs and terrorism will continue despite criticisms from the opposition and other rights groups. “Terrorism and illegal drug trade continue to threaten the peace and stability of our nation, thereby affecting our economy and even the moral fiber of our society,” he said.